I've gotten this question more and more recently. "Tobias, why do you write? Aren't you a Designer?" I thought about this question a lot in the last couple weeks. All I know is that writing had a huge impact on my life. And the more I thought about it, the more I found out what exactly writing did to me as a person and my career as a designer. I started writing less than two years ago. Before that, I rarely wrote anything. There might be many reasons for it, but first of all I never thought of myself as a writer. And second, I was too afraid of doing something wrong. Now, two years later I can't imagine a life without writing. Two years ago I've published the first thing of what we can consider an article. And a little over a year ago I started forcing myself to write more consistently every week. Writing became many things for me, and I'd like to take the opportunity with this article to tell you why. Maybe you will even consider writing for yourself. The more I think about this tweet, the more I think it's a little bit more than just a joke. It's the truth. The pure act of writing has a therapeutic effect on me, similar to meditating. Expressive writing makes you sit down and write put everything that's on your mind. There are no rules you need to stick to. You simply pick a piece of paper, or sit in front of the computer and start writing. You write about your day, your relationships, about the weather and what you had for breakfast. The act of writing and putting it on paper eases your stress leve and helps you deal with more important things. And I'm not even talking about writing articles that are meant to be published, but just writing for the sake of writing. The amount of research I do just because I'm trying to write something is much higher than if I wouldn't write at all. Every time I write an article, I need to do research first. That means, I need to read ten other articles, read a book, watch a video or simply just get my head around a research paper to form my opinion. Before I can write something, I need to understand. And to understand, I need to learn and research first. Over the last two years, writing was the activity that introduced me to so many new books or topics I had no interest in before. This is incredibly important for designers, but also for everyone else. The majority of emails I receive are poorly written. They are longer than needed, have no structure and often times no clear question. Some of them I don't know if they're informal, or if they wan't something from me. While I believe good design can solve many problems, good writing can solve as many if not even more. Few designers know this, but writing is and should be a huge part of the design process. Writing IS Design. The fact that I sit down every week to write and I just struggle for hours is a sign of how my mind looks inside. Writing helps me to keep track of my mental tabs and organize the mess inside my brain. Am I'm telling you that you should write? 1. You can write on Twitter. Short 140 character thoughts and opinion pieces. 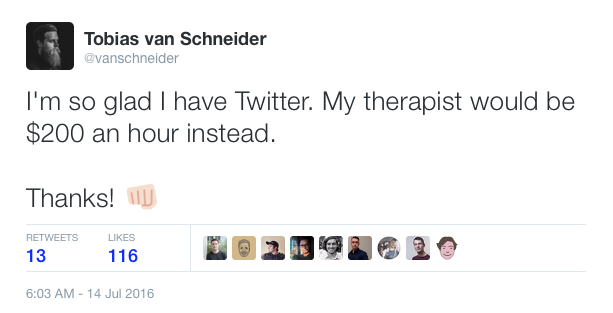 I do it a couple times a day, it's like I said, having a therapist that doesn't cost $200 an hour. 2. You can write a daily journal. You just write 30 minutes at the beginning or the end of every day, with no specific intentions. You can publish it, or just keep it for yourself. The app Day One is pretty helpful for this. The benefit of publishing your daily or weekly journals online is that someone will hold you accountable. 3. You can write little thought pieces on your personal blog/Medium about things you work on everyday. I recommend keeping them below 4-7min reading time. It's not only easier for other people to read, but also gives you a limitation so you don't get too carried away. You can use the app Hemingway or websites like this one to measure your average reading time on articles. Generally, 4-7min reading time averages at around 800-1200 words. As always, I thank you for reading and hope you enjoyed this weeks edition of this email. If you already write and publish your writings, or if you're starting to do so, please let me know via Twitter. PS: The response on my last weekly email about the effects on Pokemon Go skyrocketed. I made sure to post it on Medium, so feel free to share it with anyone you like. Wish you a fantastic week! How Many F*cks do you Give?